This is a Sunshine Coast Directory of Powell River Concrete Contractors & Suppliers. 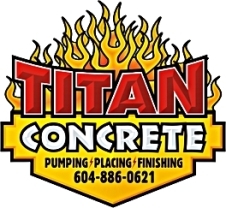 Titan Concrete is able to handle all of your concrete needs. A boom truck and line pump are available for pumping jobs big and small. Placing and finishing can be accomodated by a crew with over 25 years industry experience. Colored concrete, stamped concrete and exposed aggregate applications are just a few of the services provided by Titan Concrete. Call 604-886-0621 to discuss your concrete needs today! If you are looking for a concrete contractor or supplier in another Sunshine Coast community, be sure to check the other Service Directories from the Sunshine Coast homepage.